Acne can be very stressful. Although it cannot be completely cured, it can definitely be controlled with proper treatment. There are numerous creams and lotions available for treating acne spots. 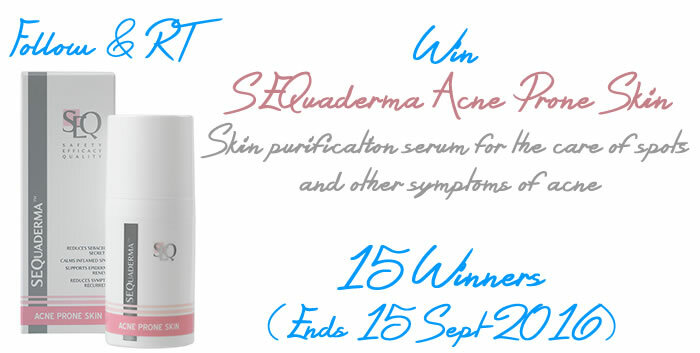 SEQuaderma uses the ‘Innovation Award’ winning Sequessome Nanotechnology® to create a range of skin care products for the care of skin affected by conditions as acne, rosacea, eczema, seborrhoeic dermatitis, skin ageing and hyperpigmentation. Their Acne Prone Skin product is a skin purification serum for the care of spots and other symptoms of acne. And today you have the chance to win 1 of 15 of this product, thanks to SEQuaderma. Entry is very simple. Head to my Twitter account to enter. All the best! 1. Follow me on Twitter and retweet the competition tweet. 2. You can retweet one or all of the tweets about the competition. 3. Open to UK residents aged 18+ only. 4. 15 winners will be picked at random from the participating entries. 5. Winners announced between 16-18 September and will be contacted via Twitter.